After the Monkey Socks I wanted to make a pair in this wool/cashmere with a bit of nylon yarn from The Loopy Ewe. This yarn is soft on the hands and lovely to work with. The white "spots" are where the dye seemed to "miss" on the skein. I was a bit concerned about how it would look and because I'd never used this yarn before whether this was "normal". However the flecks look quite attractive. I used this free pattern. 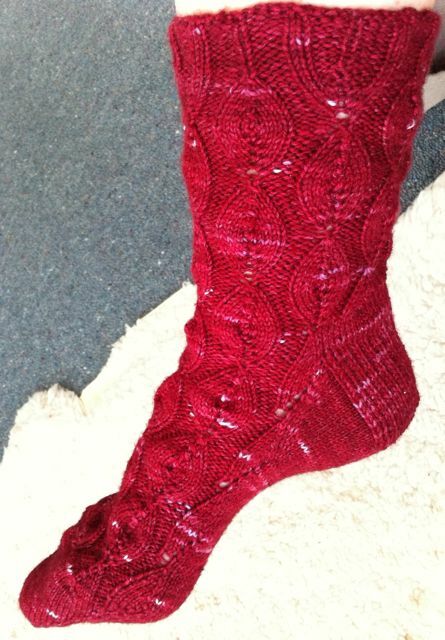 I had previously made this pattern (forgot to photograph before giving away) from this pattern but for these ones I adapted them for toe up socks. Not too girlie for man! A whole month with no posts!